Buttress, castle, coat of arms, crenellation, crest, drama, education, Gothic, Launceston, Launceston Church Grammar School, Mowbray, parapet, pointed arch, Tom Room, school, shield, Tas, Tasmania, tower. 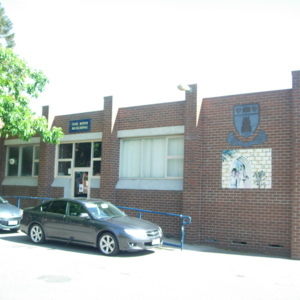 Launceston Church Grammar School has two campuses in the northern Tasmanian city of Launceston. The relatively recent brick Tom Room Building continues the medieval theme found elsewhere on the campus by the use buttresses that end as crenellation. The building also features the school coat of arms/crest of a castle with towers and crenelated parapets on a shield, as well as a drawing of a Gothic pointed arch doorway. The building has drama and multi-purpose classrooms. This photograph was taken on the Mowbray campus. buttress, castle, coat of arms, crenellation, crest, drama, education, Gothic, Launceston, Launceston Church Grammar School, Mowbray, parapet, pointed arch, school, shield, Tas, Tasmania, Tom Room, tower. “Tom Room Building, Launceston Church Grammar School, Tasmania,” Medievalism in Australian Cultural Memory, accessed April 25, 2019, http://ausmed.arts.uwa.edu.au/items/show/1250.